Just a half an hour before midnight on Tuesday, fans lined up in front of ticketing machines in a local cinema in Beijing to get their tickets for Marvel Studio's final film in the Avengers series - Avengers: Endgame. The first group of moviegoers in the world to get to see the film, Chinese fans of the Marvel Cinematic Universe (MCU) were ready to spend an exciting night at the cinema. Several days before the 2019 Spring Festival, Hello, ONE PIECE! Luffy is Coming! left Shenzhen and arrived in at the Sichuan Museum in Chengdu, Sichuan Province. The special exhibition on world famous Japanese manga One Piece quickly became a hit on social media, especially among the large number of the manga's fans in China. A group of German friends claimed a world record on Saturday for the highest number of smurfs gathered in one place. Millions of wuxia fans from home and abroad flooded social media platforms to express their shock and sorrow after news hit that renowned Chinese martial arts novelist Louis Cha, widely known by his pen name Jin Yong, passed away in Hong Kong on Tuesday at the age of 94. The comic book character Sanmao is probably one of the most well-known characters in China. 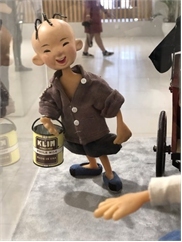 The comic strip Adventure of Sanmao starring the skinny boy with only three hairs on his head has been beloved by children in China for generations. An airport in western Japan renamed after a popular comic and anime about a boy sleuth, "Detective Conan", has completed a revamp and looks to attract more tourists to Tottori Prefecture, local media reported. Comic book legend Stan Lee has terminated a $1 billion lawsuit alleging that the entertainment company he co-founded had tricked him into signing away his image rights. Marvel Comics is looking to expand its presence in the Chinese market with two Chinese-language comic series co-produced with Chinese online comic platform NetEase Comics. China signed 355 contracts to buy Japanese animation in 2016, making it the biggest buyer of the year, according to "Anime Industry Report 2017" by the Association of Japanese Animations. The 10th China International Cartoon Festival is set to open on Sept. 30 in Guangzhou, capital of south China's Guangdong Province. An animation lover dresses up during the Taipei International Comics and Animation Festival in Taipei, southeast China's Taiwan, Feb. 2, 2016. The festival opened on Thursday, and will last until Feb. 6. Batman and Superman portrayed as fierce Terracotta Warriors? While such a combination may seem a bit random to some, they are a perfect fit in the eyes of Chinese painter Zhang Wang. The 20th Animation, Comics and Game Expo, the largest of its kind in North China, kicked off at the China National Convention Center in Beijing on December 31, 2016. Thousands of products representing the latest in animation, comics and games will be on sale at the event, where guests will also have the chance to enjoy cosplay shows, 2-D celebrity fan meetings, and other entertaining activities. Cosplayers pose during the Anime Revolution event in Vancouver, Canada, Aug. 5, 2016. Opening on Friday, the three-day animation convention will hold a wide range of activities and exhibits including animation, gaming, costuming and cultural displays. Visitors flocked to the first ever Beijing Comic Convention (BJCC) held on June 9 and 10 at the New China International Exhibition Center in Shunyi District, Beijing. BJCC was hosted by ReedPOP, the same team behind the very first New York Comic Convention (NYCC) back in 2006. The two-day event featured some of the latest movies, TV shows and graphic novels from the world of comics, with stars such as Brandon Routh, Dean O'Gorman and Ming-Na Wen also in attendance to sign autographs and take photos with fans.